A mixed case of organic red wine, guaranteed to cheer with their mellow warmth. 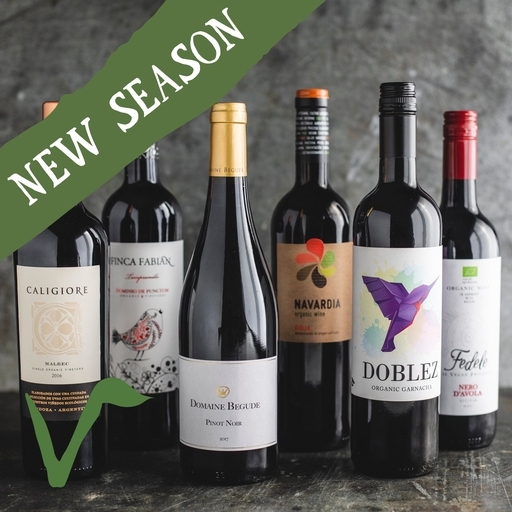 Your case includes: Finca Fabian tempranillo, Caligiore malbec, Domaine Begude pinot noir, Fedele Nero d’Avola, Garnacha Doblez, and Navardia rioja joven. Pre-packed case price is cheaper than buying 6 full priced individual bottles. Finca fabian tempranillo 75cl: 100% Tempranillo, Alcohol 13.5%, sulphites 50mg/l, produced in Spain, Suitable for vegans. Caligiore malbec 75cl: 100% Malbec, Alcohol 14.5%, sulphites 69mg/l, produced in Argentina, Suitable for vegans. Domaine begude pinot noir 75cl: 100% Pinot Noir, Alcohol 13.5%, sulphites 35mg/l, produced in France, Suitable for vegans. Garnacha Doblez 75cl: 100% Garnacha, Alcohol 13.5%, sulphites 82mg/l, produced in Spain, Suitable for vegans. Fedele nero d’avola 75cl: 100% Nero d’Avola, Alcohol 13.5%, sulphites 83mg/l, produced in Italy, Suitable for vegans. Navardia rioja joven 75cl: 85% Tempranillo, 10% Garnacha, 5% Graciano, Alcohol 14%, sulphites 45mg/l, produced in Spain, Suitable for vegans. Keep lying down in a dry, dark place. Produced in Spain, France and Italy.